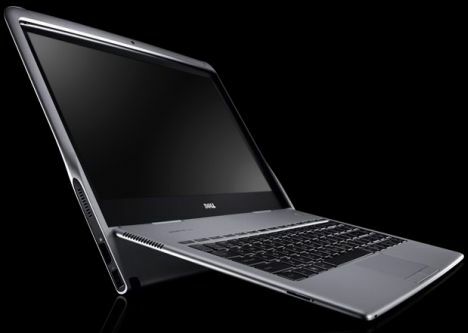 Dell has bettered its wafer-thin Adamo laptop launched in March with the announcement of the 0.4-inch (9.99mm) thin Adamo XPS. 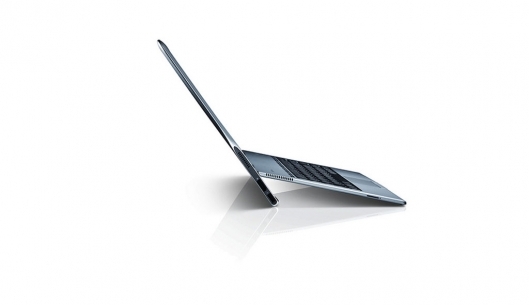 Apart from the attention that the label of World's thinnest laptop brings, the XPS has some very appealing design qualities that are nothing to do with its slender profile or 3.2 pound weight. Rather than the conventional hinge, the full-size keyboard folds into the display in such a way that it's raised at the top when it's opened to provide enhanced cooling and there's also a capacitive touch latch mechanism which allows you to pop the unit open with the swipe of a finger. The Adamo XPS runs on an Intel Core 2 Duo (1.4Ghz) ultra-low voltage processor, sports 4GB DDR3 800 memory, and like its predecessor it has a 128GB solid state hard drive. The 13.4-inch WLED display is high-def (720p), there's built-in 802.11n wireless, display port video out, 2 x USB ports (giving it an edge on the MacBook Air in that department) and an Ethernet dongle is included. The gesture touchpad looks to be conveniently positioned close to the front lip and the full size keyboard includes aluminum keycaps. Battery life is likely to be a little disappointing at around 2.5 hours, but Dell says a higher-capacity option can extend this to more than 5 hours. The Dell Adamo XPS is expected to be available "in time for the holidays" and will ship with Windows 7 64-bit edition starting at US$1799.